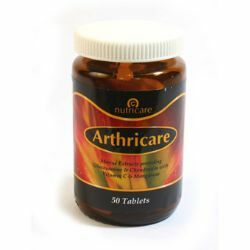 Arthricare is a product designed specifically for powerful arthritis pain relief. It may help offer relief of aches and pains in the muscles and joints. Ingredients include glucosamine, chondroitin, Vitamin C and Magnesium. Extracts of crustacean shells and shark cartilage are standardised in Arthricare to provide high levels of the important joint nutrients Glucosamine Sulphate and Chondroitin. The extracts are then fortified with Vitamin C and Manganese to produce a complete supplement of exceptional quality. This helps to maintain joint mobility. Glucosamine and Chontroitin Sulphates are 'synergistic' which means they are more potent and effective when used together, they help promote cartilage development and improve joint function. - Glucosamine Sulphate; is the starting point for the making of many important tissue structures such as cartilage, tendons and ligaments in our bodies. Chondroitin Sulphate; is a major component of connective tissue, such as cartilage, tendon, ligaments and even bones. Adequate amounts of Chondroitin are essential for joints, organs, muscles and connective tissue cells to maintain their specific function. It is known as the 'water magnet' because it helps at attract fluid into molecules which is essential in the absorption of shock. It also nourishes and lubricates the joints. Unfortunately, our body's ability to produce Chontroitin Sulphate may be inpaired with age, injury or stress.